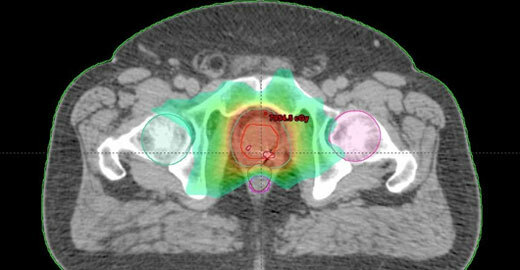 The image above shows an IMRT plan for treating prostate cancer. The area in red is the prostate gland. IMRT focuses high doses of radiation on the prostate while keeping the dose to the surrounding tissue at a minimum. Intensity Modulated Radiation Therapy or IMRT is a cancer treatment procedure that can deliver higher doses of radiation directly to cancer cells than is possible with conventional radiotherapy. In addition, IMRT can deliver these higher doses while limiting the dose to healthy surrounding tissue. Because of this ability, IMRT can be utilized to treat tumors that until recently would have been considered untreatable due to close proximity of vital organs and structures. This image shows a multi-leaf collimator with 120 individually adjustable leaves. These leaves move across the irradiated tissue while the beam is on, blocking out some areas and filtering others to vary the beam intensity and precisely distribute the radiation dosage. 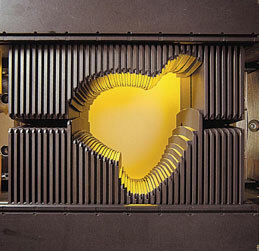 With IMRT, very small beams, or beamlets, are aimed at a tumor from many angles. During treatment, the radiation intensity of each beamlet is controlled, and the beam shape changes hundreds of times during each treatment. As a result, the radiation dose bends around important healthy tissues in a way that is impossible with other techniques. Because of the complexity of these motions, physicians use special high-speed computers, treatment-planning software, diagnostic imaging and patient-positioning devices to plan treatments and control the radiation dose during therapy. A linear accelerator equipped with a special device called a multileaf collimator shapes the radiation beam, and delivers the radiation in accordance with the treatment plan. We are proud to be able to offer both conventional IMRT and RapidArc IMRT. 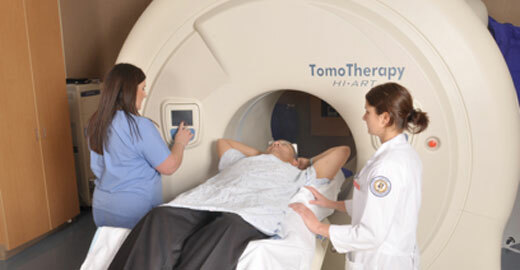 A patient ready for IMRT treatment with TomoTherapy.